The newest clearomizer offering from Innokin is eye-catching thanks to its good looking stainless steel construction and ball-joint drip tip. 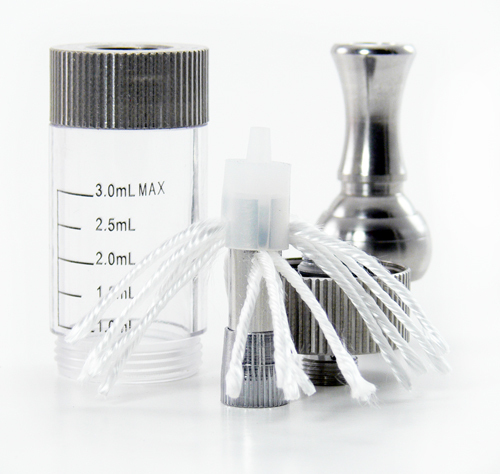 The iClear 30 Dual Coil Clearomizer’s fluted top and bottom end caps as well as the articulating drip tip look great in stainless steel. It’s a good looking package wrapped around a dual top coil setup that also impresses. The iClear comes packaged in a great looking clear case with minimal instructions printed on the outside. The rotating drip tip is a nifty feature to include in a clearomizer and it rotates easily at about a 25 degree angle, making a larger device more comfortable to hold. The large ball base has a tube on the bottom that threads easily into the top of the tank. This design makes filling access easy and less stressful on the plastic tank as the top cap stays in place. 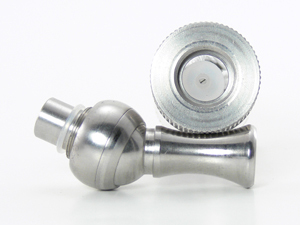 The base is also longer than most drip tips, allowing it to make a firm seal against the top of the coil assembly. Filling is accomplished easily with a regular dripper bottle and it is easy to avoid getting juice in the center airflow hole. Inside the tank is a familiar top coil assembly that also boasts an impressive design. There are dual coils inside of the assembly, each with four long wicks that stretch easily to the bottom of the tank. The setup provides better wicking than we’ve seen in most top coil designs, and we’ll cover that in more detail in a moment. The iClear is available from SmokTek in both 1.5ohm and 2.0ohm ratings and the 1.5ohm that we tested measured exactly that. The bottom cap does unscrew from the clear tank, allowing for easy removal of the coil assembly for cleaning or coil replacement. Replaceable coils make this tank more economical, but ease of cleaning the wicks and the tank when changing flavors is also a great feature of the design. 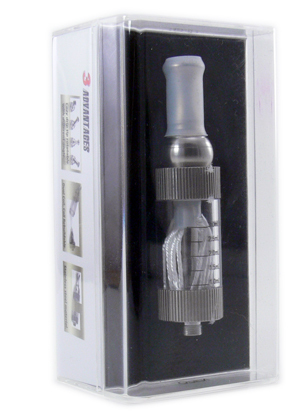 The iClear 30 is a fine performing clearomizer right from the start. As long as the wicks are allowed to saturate first, there is none of the burnt or chemically taste that we’ve seen in some other clearomizers. The flavor production is very good, as is the vapor. Airflow is a little on the airy side, but not objectionably so. The perception of being slightly airy may actually have something to do with the movable drip tip, which is really my only complaint about this device. And it’s not really a complaint so much as a personal preference thing. I’m just not a big fan of metal drip tips or adjustable ones. I think the added length and heat transfer properties of the metal cool the vapor a little too much. Repeated long hits bear out this hypothesis, as the vape gets warmer as the tip gets warmer. Which brings me to the impressiveness of the wick and coil design of the iClear. Repeated long hits really are possible with this clearomizer. Even with a nearly empty tank and even when held completely upright the vapor tastes great. I am really somewhat amazed at how well this thing wicks when held completely upright and I’m almost wondering if the design of the articulating tip was incorporated just because it can actually be used without tipping it on its side every few seconds. The 1.5ohm iClear is very good on a 3.7volt device, but really shines at slightly higher voltages. 4 volts, equating to just over 10 watts makes for a very smooth and tasty vape. As voltages were increased, the vape got unpleasantly strong and lost flavor, but did not taste burnt, further testament to the excellent coil and wicking design. I haven’t been too impressed with many of the top coil clearomizers due to the occasional dry hits and burnt taste due to poor wicking. The iClear 30 is one of the best, if not the best top coil clearomizer I’ve tried and exhibits no wicking problems. Even though I’m not a big fan of the metal drip tip, I just realized that I’ve come to the end of a second 3ml tank in the past few days, so it can’t be bugging me that much! All in all, this tank gets an easy recommendation for a problem free clearomizer option for new users and veterans alike. At $13.95 from SmokTek, it’s a reasonably priced tank and replaceable coils make it even more so, especially given the solid design that is likely to last quite a long time. Note: The iClear 30 was provided by SmokTek for the purposes of this review. 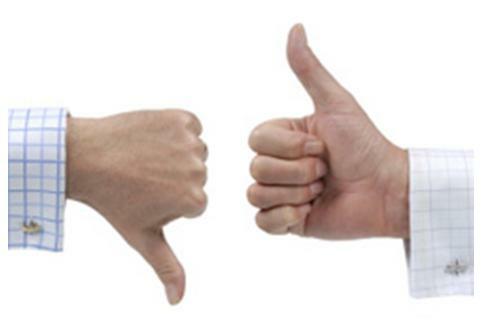 As always, we heartily appreciate the opportunity to try new goodies, but do our best not to let it influence the review.